Peninsula offers Valplast flexible dentures – the most comfortable, aesthetically appealing and functional partials available. With this product, dentures and final restorations can be achieved in a quick and accurate manner. Our team came up with a more affordable option compared to fixed restorations, but only slightly costly than traditional dentures with noticeable metal clasps. Our Valplast flexible dentures provide a distinctly beautiful visual quality that is unparalleled. Our Valplast flexible partials can give you that unrivaled confidence as you eat, talk and most of all, smile! Virtually appealing as it is almost invisible. 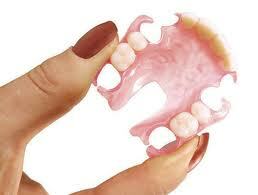 Our Valplast flexible partial dentures are guaranteed to resist fracture and breakage in its base with normal usage. We offer guarantee to our appliance, from the date of installation. The guarantee is applicable to resin or material defects along with other guarantees that are provided by our expert dental laboratory technicians. Why choose usThe plate of these dentures is more flexible while the plastic material that covers the mouth is not visible. The great thing is, there is no more need for metal clips to hold the dentures in place. With just a fraction higher than conventional dentures, you will get hold of a highly durable and light denture that comes in a variety of colors to match the tissues in your gums. These dentures may look fragile, but you have no idea how durable these are until you try them! Our Vaplast dentures are made from highly flexible and strong materials. You may accidentally drop these on the floor and still remain free of breaks or fracture. We can guarantee our Valplast flexible partials to last for two decades or more when combined with proper cleaning and regular maintenance and checkups. Looking for a dental clinic on the Mornington Peninsula that can determine whether Valpast flexible partial dentures are suitable for your teeth? Contact us today on (03) 5981 2255 or book online peninsuladentalcare.com.au for a consult so that we can assess your suitability.